The VigorSwitch G1241 is a high-performance Gigabit Ethernet switch. It provides facilities for maximising your LAN performance and also increasing security security, including VLAN groups (port or tag based) as well as QoS prioritisation and traffic/bandwidth control. The G1241 is compact, only 267mm wide and 162mm deep, making it ideal for space constrained locations or crowded racks. Rack mount brackets (included) extend the unit to standard 19" rack width, if required. 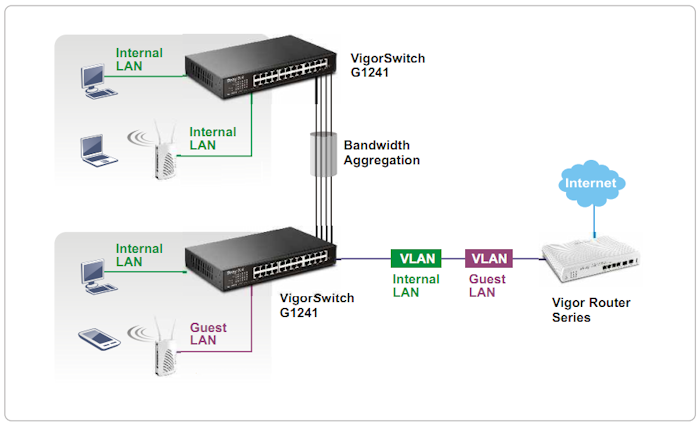 The VigorSwitch G1241 also supports link aggregation; useful for increasing speed between other switches or high-performance servers and dual-stack IPv4/IPv6. Multiple diagnostic and LAN protection methods are supported; by use of the port mirror facility, you can help tack network errors or abnormal traffic without interrupting the flow of data, allowing ingress data to be examined from a single port.